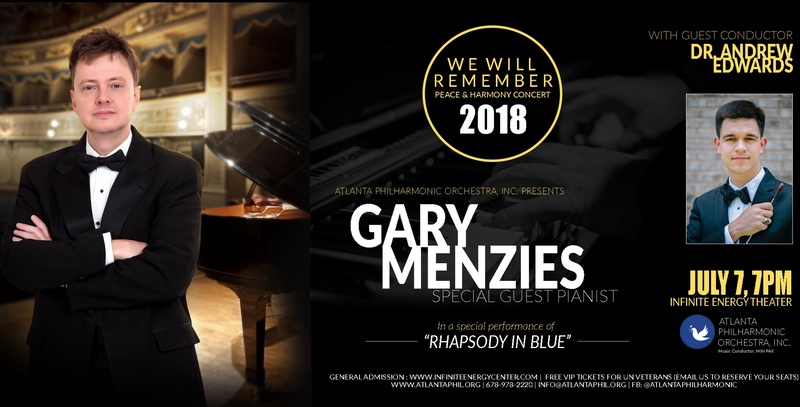 "Rhapsody In Blue" will be performed live by special guest, the very talented, Gary Menzies, on the piano, together with our guest conductor, Dr. Andrew Edwards. There will be a lot more performances that you surely wouldn't want to miss. Brought to you by Atlanta Philharmonic Orchestra, Inc. So save the date! July 7, 2018 at Infinite Energy Center (Theater). Don't forget to get your tickets now! "Free VIP tickets for UN & Korean War Veterans! They are advised to email us to reserve their seats as these are limited."